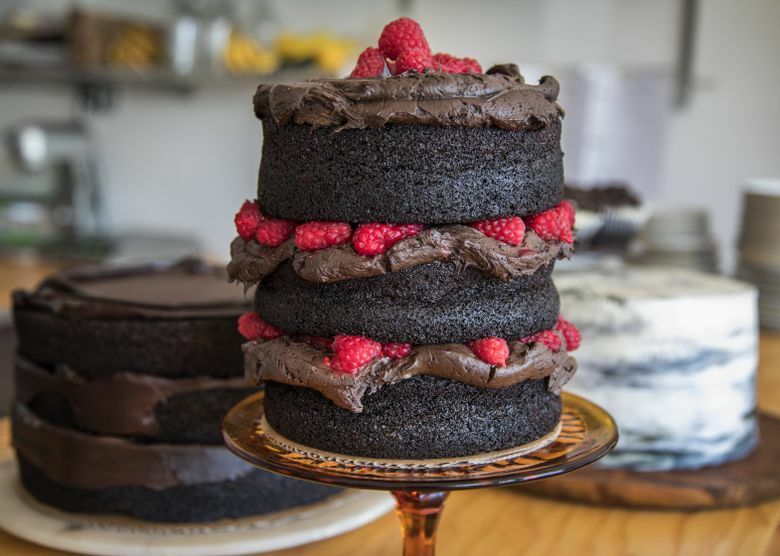 Charlie Dunmire is making beautiful cakes in a shop that had been a Georgetown grocery store for more than a century. JUST TO GIVE YOU some idea how long this storefront on Carleton Avenue has been central to the Georgetown neighborhood, there’s a horse and buggy parked out front in one historic photo. 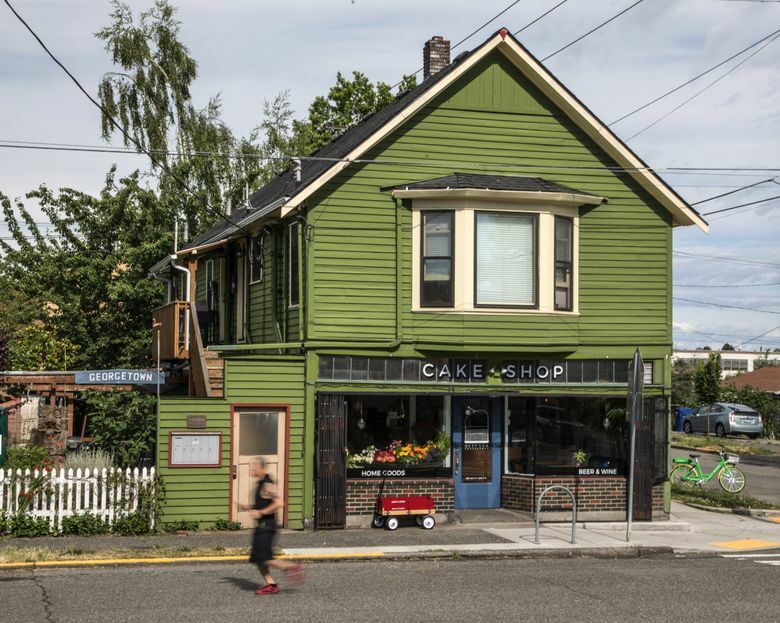 For a calmer century or so, the old-fashioned building at 6601 Carleton Ave S. was a neighborhood market drawing in locals for milk, eggs and friendly conversation. It was the end of one era when the last proprietors of the Carleton Grocery, Georgetown history enthusiasts Allan Phillips and La Dele Sines, closed its doors last year. But in another way, the building, remodeled and refreshed, is blossoming into a new community hub. 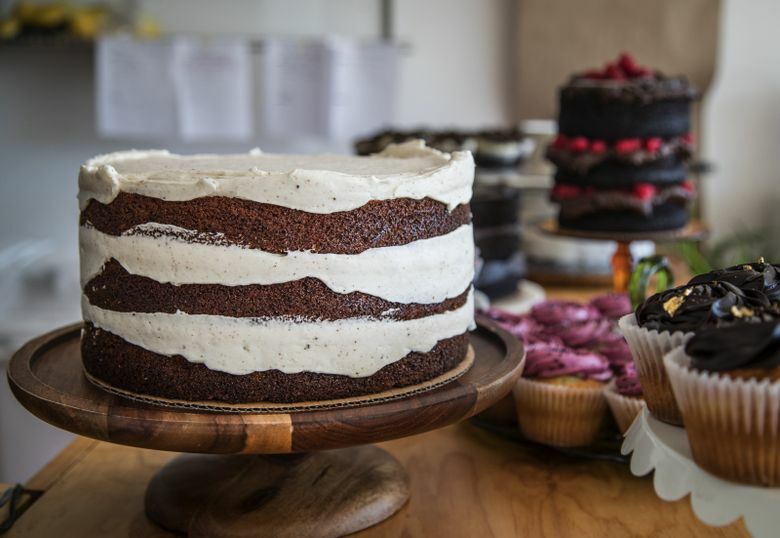 It’s now a cake shop, Deep Sea Sugar & Salt, drawing a steady line for staggeringly lovely, sky-high layer cakes in the signature style of owner Charlie Dunmire. The painted boards of the old market shelving have been pulled out — but stripped and refinished rather than discarded, and given new life as antique fir tables for the cafe. Drip coffee was brewed, and buckets of peonies decorated the windowsill on one recent day, almost as striking as the flowers and frosting and sophisticated flavors of the cakes. 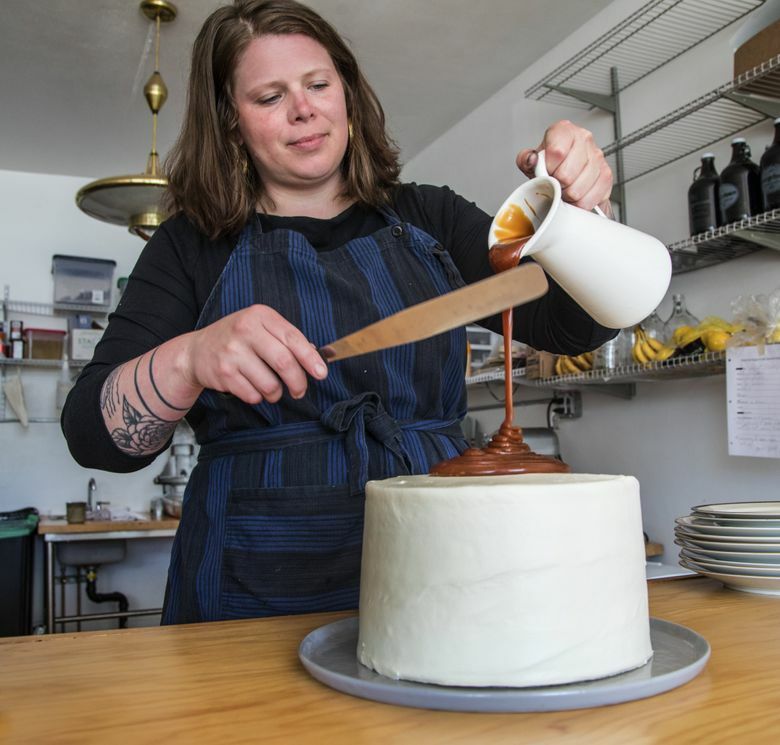 Dunmire is loved for creations like her London Fog cake with Earl Grey syrup and bergamot-mascarpone cream, and her “9-pound Porter” chocolate cake made with Georgetown-brewed beer. “It’s always been important to me when I’m eating to taste the flavors and not be overpowered by sweetness. 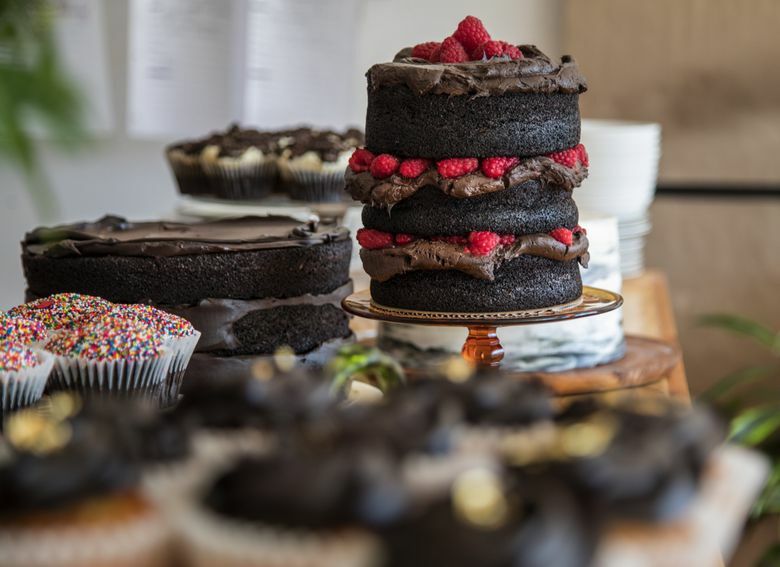 A lot of them start with an ingredient where I really want something to shine,” she said on a recent day when I, a fairly typical customer, wound up eating a slice of London Fog with my fingers at the bus stop because I just couldn’t wait. Born and raised in Edmonds, Dunmire got her first job at 16 at the Edmonds Bakery to raise money for a school trip to Ireland. After high school, she joined AmeriCorps, spending a year doing relief work on boats in hurricane-ravaged Louisiana. The years after were a jigsaw puzzle of training and jobs that somehow built up beautifully to her current career. The pieces included time at Honey Bear Bakery, the pastry program at South Seattle College, a move to a Michigan restaurant, bartending, working at Tom Douglas Restaurants, some years as a cake decorator at Whole Foods — a “very nice adult job” that she quit to go to sea, working first as a cod processor, exhausted and half-frozen, and then for a delightful season as ship’s cook. At every stop, she met friends, colleagues and mentors. 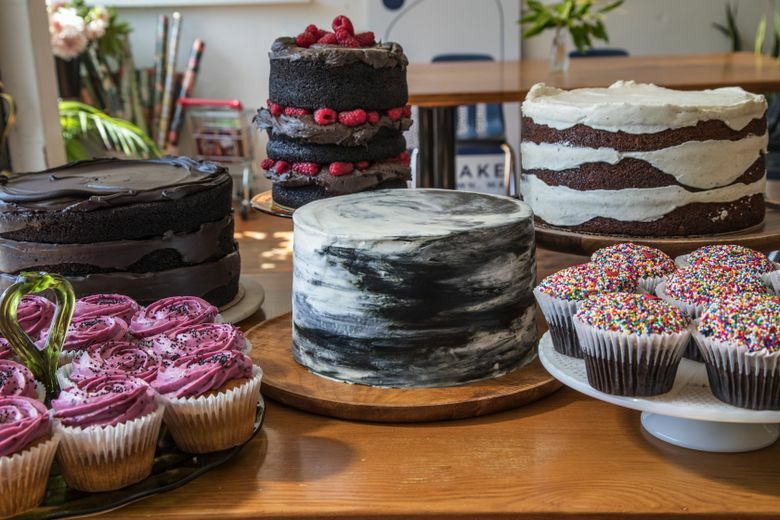 And in cakes, she found a way to put “all the components I wanted” together — flavor; design; architecture; community; and, finally, entrepreneurship. 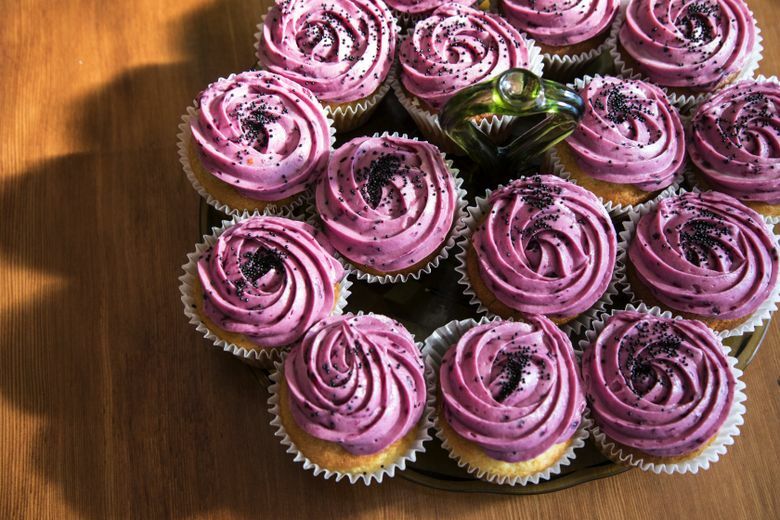 She began making desserts for restaurants in South Seattle, then added the Airstream, where she spent the week baking sweets that sold out in a few weekend hours. Now, at Deep Sea, her team and customers are settling into a new way of life. She also tells customers that, while she’s not a full-service grocery, if there’s something they’d come in to buy regularly, she’d stock it, just like the building’s older incarnations would. “I felt it was important to preserve this space as something old and historic” — and something with a greater purpose.